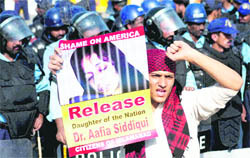 Aafia Siddiqui, a Pakistani woman neuroscientist who was convicted of trying to kill American soldiers in Afghanistan, has been sentenced to 86 years in prison by a court in Manhattan amid high drama. In a remark that sparked outrage in the US, Iranian President Mahmoud Ahmadinejad has said some segments within the US government orchestrated the 9/11 attack to reverse the declining American economy. The state of Virginia in the US yesterday executed its first woman in nearly a century for the murder of her husband and step-son in a plot concocted to reap their life insurance money, state officials said. The execution of Teresa Lewis, 41, drew protests in particular because of her low IQ of 72, just two points above the level of mental disability that would have protected her from execution in the state of Virgnia. The 38-year-old MIT-educated Siddiqui’s case had attracted wide attention, particularly in Pakistan, where she was widely portrayed as a heroine. Siddiqui’s lawyers had requested a sentence of 12 years while federal prosecutors had pressed for life imprisonment, New York Times reported. In a remark that sparked outrage in the US, Iranian President Mahmoud Ahmadinejad has said some segments within the US government orchestrated the 9/11 attack to reverse the declining American economy. The Iranian President told a UN meeting that most people believe the US government staged the 9/11 attacks. 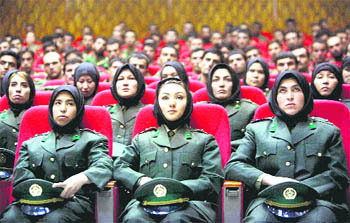 There was a theory that “some segments within the US government orchestrated the attack to reverse the declining American economy and its grips on the Middle East, in order also to save the Zionist regime,” Ahmadinejad said, sparking a US-led Western walkout in the UN General Assembly. 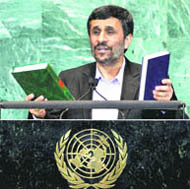 Ahmadinejad then urged the UN to carry out an investigation that would determine what happened on 9/11. “It is proposed that the United Nations set up an independent fact-finding group for the event of September 11 so that in the future expressing views about it is not forbidden,” he said yesterday. He also accused the US for using 9/11 to start wars in Afghanistan and Iraq, as well as bullying Iran about its nuclear programme while maintaining it own nuclear weapons. The Iranian President, however, indicated that Tehran would be ready for talks on its nuclear programme if they were premised on “justice and respect.” He also touched on the recent controversy involving a Florida pastor who wanted to burn the Quran on the ninth anniversary of 9/11. The state of Virginia in the US yesterday executed its first woman in nearly a century for the murder of her husband and step-son in a plot concocted to reap their life insurance money, state officials said. The execution of Teresa Lewis, 41, drew protests in particular because of her low IQ of 72, just two points above the level of mental disability that would have protected her from execution in the state of Virgnia. Larry Traylor, director of communications for Virginia's Department of Corrections, said death, by lethal injection, was pronounced at 9.13 p.m." Her final statement was directed at her stepdaughter, Kathy, whose father Julian Lewis, 51, and brother, CJ Lewis, 25, were shot dead in bed in 2002 by Teresa Lewis' two accomplices. Kathy Clifton was the only surviving member of her family, and under Virginia procedures was likely the last person Lewis saw before her execution. "I just want Kathy to know I love her and I'm very sorry," Lewis said, according to Traylor.